Pets and Vets was a fun afternoon as it's not everyday you see goats walking into Edmond Town Hall in Newtown, CT. 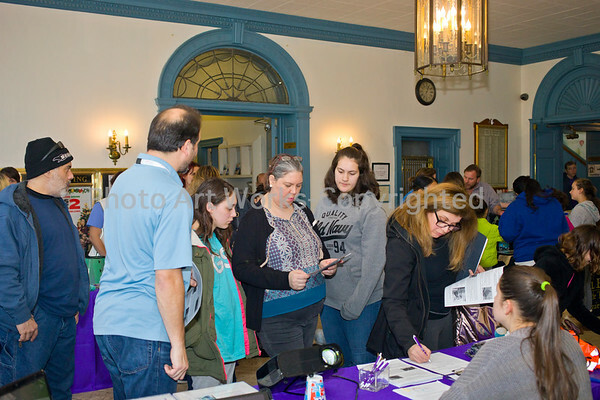 There was a terrific turnout for this free event sponsored by the Catherine Violet Hubbard Animal Sanctuary. Three adorable puppies from beCause 4 Paws a not-for-profit charitable organization in New Milford, CT were the center of attention, and by the end of the day found their forever homes. Pascal the kitten slept through the afternoon under his blanket, perhaps he was wearing earbuds? Veterinarians and students from the Cornell University College of Veterinary Medicine program Maddie's® Shelter Medicine shared information and answered questions about dogs and cats. Dr. Kimberly McClure Brinton from Country Companions Veterinary Services spoke about backyard farm animals while two goats from Litchfield County Doesy Doats literally held center stage. Chris Evers a naturalist and founder of Animal Embassy showed several exotic pets, and educated the attendees about their habits. Also attending the event were two service dogs, one in training, and the other wearing a CVH purple shirt who enjoyed belly rubs.